Sometimes the best wines around are the ones that are not generally listed in BC Liquor stores. They are known as Spec or Special Order wines. You can find these wines through some private wine shops, or you could order them through these shops, but you may need a minimum order size. 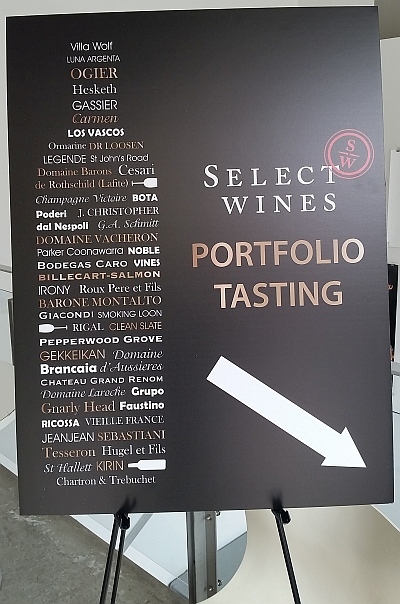 I attended Select Wines‘ portfolio tasting and enjoyed some really nice wines, but many are spec. 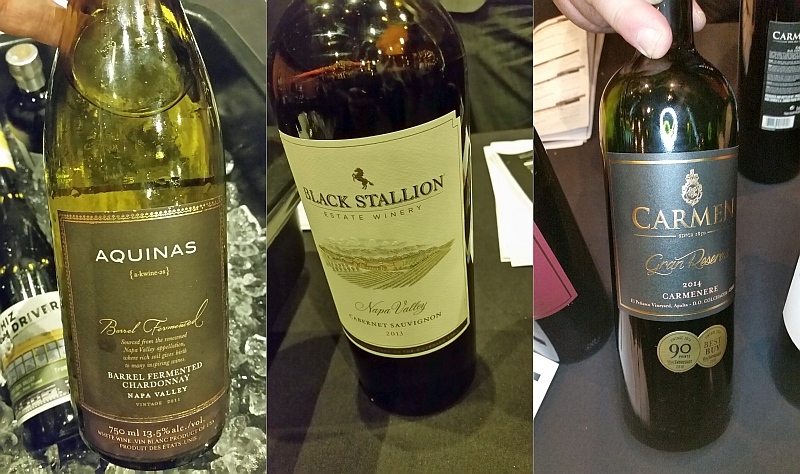 If any of these wines peak your interest, try requesting them through your local wine shop. You won’t be disappointed, and may open a new avenue for wine enjoyment from around the world! There are a few general listing wines scattered in the list. Below I’ve categorized the wines by regions. France, Italy, and the rest of the world. France and Italy on their own are the #1 and #2 producers of wine in the world, so it makes sense that they would get their own category. Enjoy. MGM Cuvage Rose Brut, France (Spec) – Light sweet red cherry, strawberry and apple aromas. Dry, medium body, and medium plus acidity. Medium sized bubble that’s semi-creamy. Light apple, cherries and toast on the palate. Charton & Trebuchet Cremant, France (Spec) – Freshly cut McIntosh apple aroma. Off dry, with medium bubble. Bruised apple, toast and some cherry flavours. Light and elegant. Champagne Billecart – Salmon Brut Reserve, France (Spec) – Light bruised apple nose. Medium body with small creamy bubble. Rich toast and bruised apple flavour. Domaine Vacheron Sancerre 2015, France (listed) – Light sweet green nose. Higher acid, medium bodied, semi round mouth feel. Tart green fruit and guava flavours. Peppery finish. Made with the Sauvignon Blanc grape. Domaine Laroche St. Martin Chablis 2015, France (Spec) – Light flinty nose. Dry, medium body with toasted oak and apple flavours. Roux Pere & Fils Bourgogne Aligote Chardonnay 2015, France (Spec) – Nice light restrained citrus nose. Medium body, dry, semi round mouth feel. Citrus and oak flavours, with hints of floral and flint. Hugel Gentil 2015, France (Spec) – I read that 2015 was an exceptional year in Alsace, where Hugel is located. This wine is a blend of aromatic varieties; Gewurztraminer 15%, Pinot Gris 22%, Sylvaner & Pinot Blanc 50%, Muscat 6%, and Riesling 7%. This wine has beautiful ripe mandarin orange and lychee aromas. Dry, medium minus body, but higher acidity. Lychee flavour mixed with some bitterness and pepperiness on the finish. Domaine Vacheron Sancerre Rouge 2014, France (Spec) – Flowers, candied cherries and raspberry aromas. Light body, dry, with higher acidity. Raspberry with some floral. Light tannins. Tasty! Another favourite. It’s Cabernet Franc BTW. Domaine Laroche Syrah Grenache de la Chevaliere 2013, France (Spec) – Darker fruit with some tarriness on the nose. Medium body, smooth with medium tannins. Ripe cassis, raspberry and dark fruit flavours. Medium acidity. A balanced wine. Montelvini Prosecco DOCG Asolo Brut Serenitatis, NV, Italy (Special order) – Fresh stone fruit nose. Medium body with higher acidity. Light stone fruit flavour and some apple and bitterness on the finish. This wine is more texture than flavour. Brancaia Chianti Classico Riserva 2013, Italy (Spec) – Mostly Sangiovese (80%) in this blend, with a touch of Merlot (20%). It’s vanilla, cedar and red fruit aromas in the glass. Soft and dry, with flavours of red and black fruits, together with vanilla and sweet oak. Finishes with some cedar. Tasty. 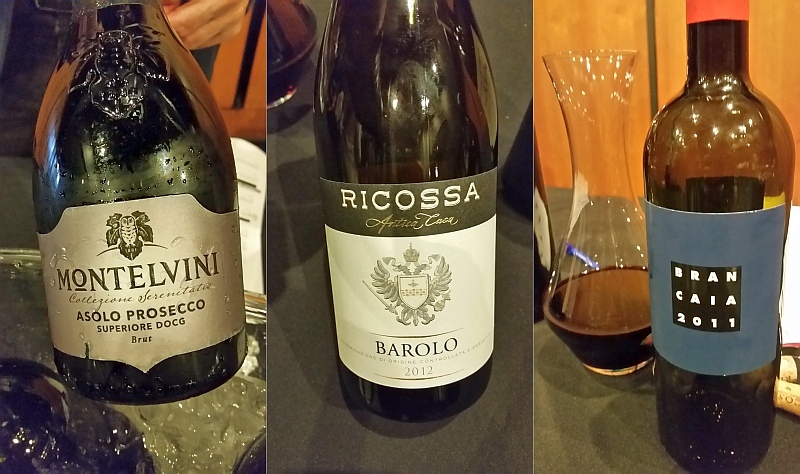 Ricossa Barolo 2012, Italy (Spec) – Made from the Nebbiolo grape, this wine has a light cherry and oak nose. Medium plus body, dry, with a fuller mouth feel. Mixed raspberry and dark fruit flavours. Spicy. Firm tannic finish. Brancaia Il Blue 2011, IGT Rosso Toscana, Italy (Spec) – A blend of 50% Sangiovese, 45% Merlot, and 5% Cabernet Sauvignon. Ripe dark fruit and dark chocolate aromas. Ripe raspberry flavour together with some pepperiness. Dry, medium minus body with a lighter mouth feel. Gusbourne Brut Reserve, Great Britain (Spec) – The first British bubble I have ever tasted! Nice toasty nose. High acidity with nice, creamy small bubble, which changes to biting edge. Toasted apple flavour. Aquinas Chardonnay 2011, California (Spec) – This barrel fermented Chardonnay has nice, medium intensity tropical fruit, vanilla and oak on the nose. Medium body, round and dry with a buttery mouth feel. Rich tropical fruit flavours and vanilla. Chalk Hill Estate Red 2014, California (Spec) – Ripe red fruit, vanilla and cedar aromas. Fuller body, round and dry. Ripe dark fruit flavours with some spice to it. Tesseron Cognac – Lot No 29 XO Exception, France – This bottle is around $1900++. A very special splurge, but well worth it. Medium plus intensity, deep, ripe apple aromas. Medium minus body, dry and very spicy up front. Tasty apples, toasted oak and vanilla, followed by apricots on the very end. LONG length. The joy in this wine is in lingering, as the flavours slowly change.